Good morning! This card was made for the Sketch Challenge over at SCS. 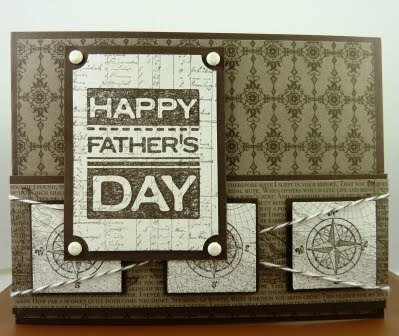 Stampin’ Up!’s The Open Sea set from the new Summer Mini catty is perfect for Father’s Day cards. I love all the different stamps in this set! My papers are also from SU – Early Espresso, Naturals White and the Early Espresso from the Neutrals Patterns Designer Series Paper Stack. The ledger sheet was stamped on a piece of Naturals White followed by the “Happy Father’s Day” image from SU All Holidays set. It was layered on a piece of Early Espresso and I added some brads from the Styled Vanilla Hodgepodge Hardware. The ticket corner punch was also used on this to make room for the brads. The small squares are stamped with the compass image, overstamped with the globe image and again layered on Early Espresso with dimensionals. I wrapped the Early Espresso/White Baker’s Twine under and over these images on the rectangular panel. That’s it! Hope you have an amazing day! Love this monochromatic masculine card! Great idea to add the twine and the overstamping on the squares is a great idea as well! Can't wait for our next SU club meeting 1st Sat. in June…then I can order some goodies from the new summer mini!